Press Release: Gamila’s Secret now in India ! Hailing from the quaint little town of Galilee, Israel, Gamila’s Secret brings to India secrets of nature captured in cleansing bars, hand creams, face oils and foot balms that cleanse your skin of impurities and toxins, leaving it nourished, protected and soft. A unique skin care brand and pioneer in all natural skin treatments from Israel, Gamila’s Secret uses no chemicals or concentrates. All products are made using the purest olive oil, 100% first pressed vegetable oils and a potent mixture of crushed and ground natural herbs – a secret formula developed by Gamila using only the family’s centuries old skin care secret treatments. It cleanses the skin, encourages its capacity for self- repair, hydrates and promotes elasticity. Suitable for the most sensitive skin types; even for those allergic to essential oils since none are added. Each of Gamila’s Original Cleansing Bars is made with a unique mix of olive oil and essential herbs from Israeli lands, individually hand carved and hand stamped. Lavender Heaven – A calming and healing fragrance, nourishes and restores balance of the skin. Suitable for combination to oily skin types. Lively Lemongrass – Refreshes and lifts the spirits, helps to balance oily skin and reduces acne and pimples. Miracle Mentha – Suitable for combination to oily skin types. Refreshes and soothes the skin. Reviving Rosemary – Revitalised the skin with a nourishing energy boost. Suitable for normal to combination skin. Spearmint Sparkle – Refreshes and restores the skin’s natural balance, curing acne and pimples. Suitable for oily skin. Soothing Geranium – A warm, green, flowery fragrance with harmonising properties. Creamy Vanilla (Premium Line) – Contains extra shea butter and essential vanilla oils to provide extra comfort for dry or cracked skin. Wild Rose (Premium Line) – Naturally rich wild rose essential oils treat your skin to a high concentration of Vitamin C to prevent premature aging and steadily even out your skin tone. A unique combination of the purest first pressed vegetable oils combined with Gamilla’s secret herbal formula. This 100% natural face oil is rapidly absorbed by your skin and gives all the nutrition and care it needs. It replaces your serum as well as your day, night and eye creams. 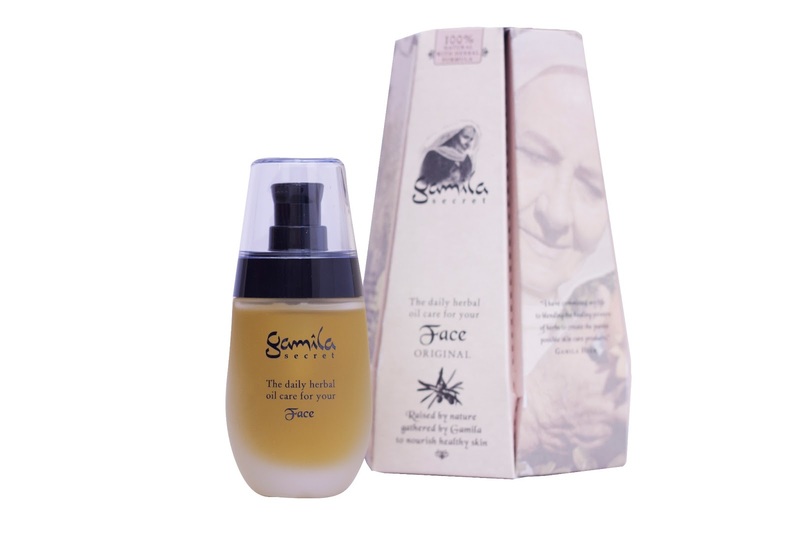 Gamilla’s Secret Face Oil makes your skin healthy, soft and younger looking. Suitable for all skin types, even oily skins. Also great for men to use after shaving. Gamila’s Secret Hand Cream is a 100% natural hand cream made from a mixture of the finest possible first pressed vegetable oils combined with Gamila’s secret herbal formula. It offers you a balm, with a sweet orange citrus fragrance. It helps to preserve the beauty and youth of your hands, while soothing your skin and improving suppleness. Gamila’s Secret Hand Cream penetrates immediately, leaving a non oily, silky soft and smooth feeling. Thus repaired and protected, your hands look more beautiful. The 100% finest combination of the purest first pressed vegetable oils, combined with Gamila’s secret herbal formula offers you a balm with a natural mint fragrance. This intensively hydrating, optimum moisturising treatment helps soothe, soften and revitalise dry feet; the perfect formula for hardened, irritated skin and aching, tired feet. Nature holds many secrets for us. Most of them will never be discovered. But every so often, one of them is unravelled and a whole new beautiful world opens up to us. Infusing the power of nature in skin nourishment, Gamila’s Secret is a unique brand that has carved a sophisticated and conscientious market for itself in the realm of luxury skin care. Originating from the quaint town of Galilee in Northern Israel, Gamila’s Secret brings to you centuries old skin treatments and procedures, modified into a contemporary form. Using only combinations of the purest olive oil, first pressed 100% vegetable oil and the most potent natural herbs of the land, Gamila’s Secret offers cleansing bars, face oil, hand cream and foot balms that all contain Gamila’s special secret skin care mix. Raised by nature. Gathered by Gamila. To nourish healthy skin.